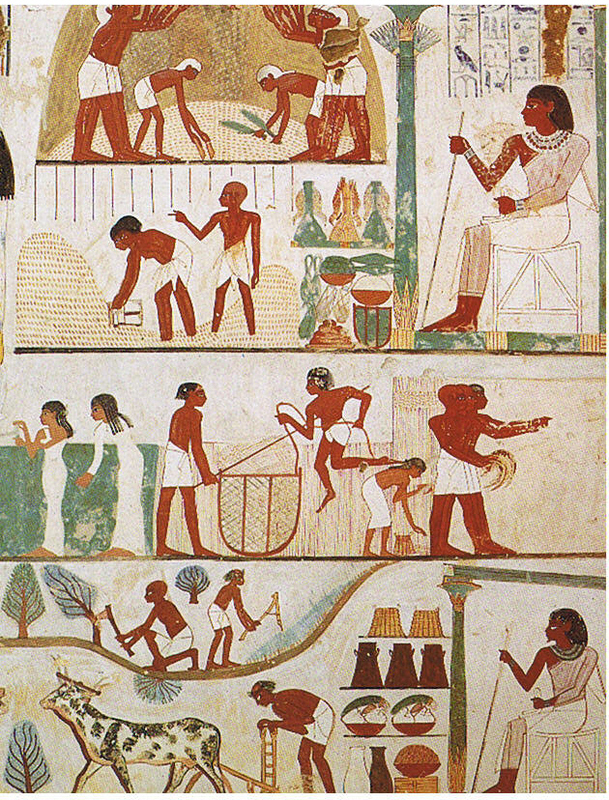 In Understanding Comics, which Stewart Brand described as “a seminal work at the level of Edward Tufte’s Envisioning Information,” Scott McCloud defined comics as “Juxtaposed pictorial and other images in deliberate sequence, intended to convey information and/or to produce an aesthetic response in the viewer.” Using this definition, McCloud proposed several examples of the earliest known comic: the 11th-century CE Bayeaux Tapestry, which tells the story of William I’s conquest of England; the Codex Zouche-Nuttall, an illustrated 14th-century CE Mixtec manuscript that narrates the life of Lord Eight Deer Jaguar Claw; and Egyptian tomb paintings like the harvest scenes in the Tomb of Menna, or this example from the Tomb of Nakht. 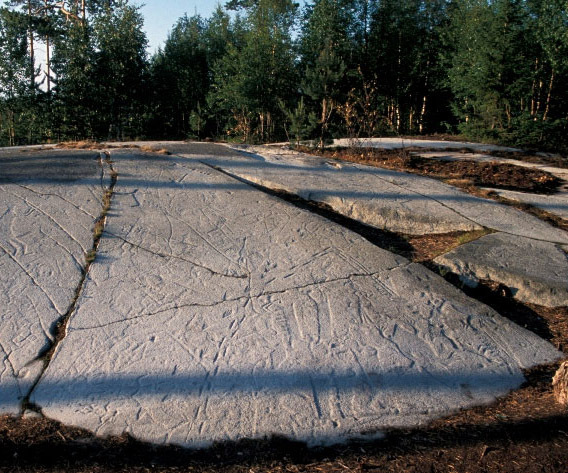 Older than all of these, though, are the Kanozero Petroglyphs in northwestern Russia, which were carved between 5,000 and 6,000 years ago. On an expedition in 02012, Jan Magne Gjerde and his colleagues from Tromsø University Museum peeled layers of sod from the ancient stones, revealing images of boats, moose, beavers, and harpoons. 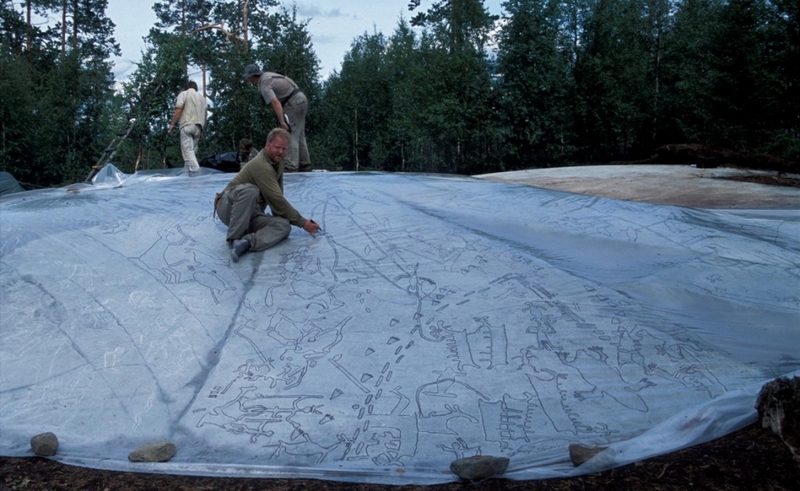 In their ten days at the site, Gjerde and his team colored the petroglyphs with chalk, covered them with plastic sheeting, then traced their outlines onto the plastic with felt-tip pen. Although it was a cumbersome procedure—especially when unexpected rainstorms drenched the plastic sheets—it produced a portable record of the carvings that could be taken back to the museum and studied at length.